Easy to use. Strong. Rust proof. Looking for a strong D-shackle for heavy lifting and towing? Our load rated D-shackles are perfect for supporting a heavy load. Our shackles are perfect for heavy lifting and static systems where a reliable strong D-shackle is needed. Each load rated screw pin shackle comes with a galvanised steel body and yellow screw pin. They can be used the same as regular D-shackles however, the rating means you know how much load they will safely be able to handle. HOt TIP: Don't Weld THEM! Welding a load rated shackle will reduce it's working load limit. What standards do your load tested shackles meet? All of our galvanised Load Rated D-Shackles meet the requirements as of AS 2741. We recommend using these shackles where high strength is required such as towing and lifting. How can I get the most out of my load rated shackle? Check the body and thread of the pin are undamaged. Check the pin and the body are not distorted or worn. The pin and body should be free from gouges, nicks, cracks and corrosion. Never modify, repair, or reshape a shackle by welding, heading or bending. This will impact the Working Load Limit (WLL). Never replace the shackle pin with a screw. How can I tell if my D-Shackle is load rated? 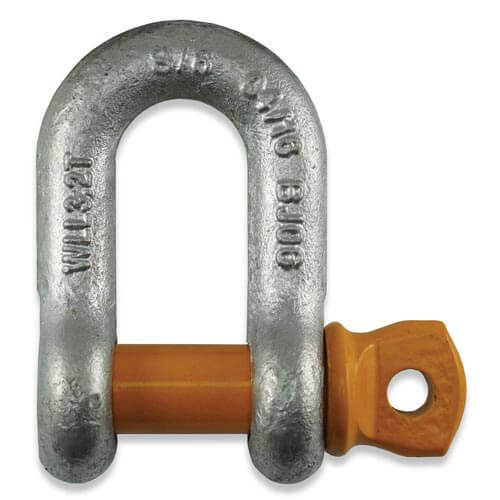 There are a number of ways you can tell if your shackle is load rated. If your shackle does not have these details, then it is likely not rated.